Craft’s Backwoods Remedy with chamomile-infused moonshine. For some reason I always thought that Craft Los Angeles was way more fancy and intimidating than it actually is. It’s the unofficial CAA cafeteria after all and has a Top Chef name attached to it. But truth be told, chef Tom Colicchio‘s high-profile spot in Century City offers a quiet, elegant bar with ample seating; tasty bar food options for every budget like the $6 pile of crispy brussels leaves (I’m so taking those to go next time I catch a movie at the Century City mall); and affordable, well-made cocktails to top it off. How have I not come here before? The cocktails are only $10 to $13! Figured the restaurant could get away with charging $18 for martinis considering all those Hollywood agents wouldn’t blink twice at those prices what with their expense accounts and all. Another pleasant surprise is that even though Craft LA’s beverage director John Dal Canton says food is a priority when thinking up new drinks, the cocktails still hold their own whether you enjoy them alone or paired with a dish. Think, as satisfying as Sotto‘s, not so much Spago, whose drinks — created by the executive chef — are toned down so as not to interfere with the food. There’s something here for both the serious drinker and the weekend tippler using unusual, housemade ingredients while still paying attention to flavor combinations. Craft’s duck fat washed cocktail. The night I visited Craft for a hosted tasting he made me a yet-unnamed duck-fat-washed and smoked brandy cocktail with apple bitters and muddled Luxardo cherries that’s marinated in coffee beans, vanilla, bourbon, brandy and orange peel. There was a bit too much fatty flavor for my tastes but it did get me salivating for my order of cheddar hushpuppies. This cocktail will pop up next month in the new winter cocktail menu which also will have four or five market-driven variations on Jerry Thomas’ classic cocktails. 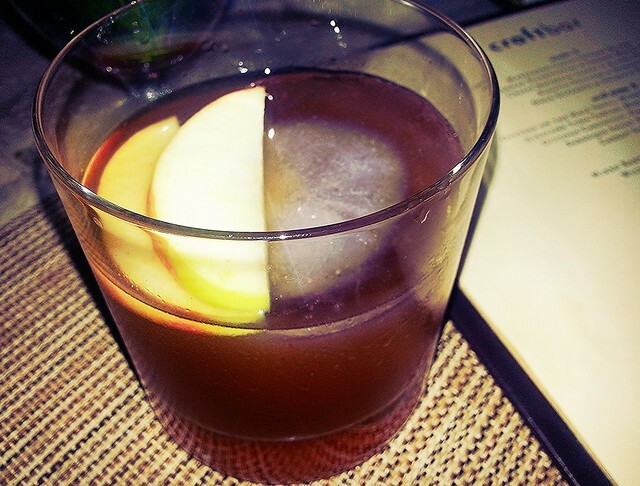 Speaking of variations, on the current menu, I loved the Backwoods Remedy, a take on the Penicillin cocktail. Made with chamomile-infused moonshine, Laphroaig, honey, ginger and Bittermens Boston Bittahs, the smoke from the scotch was actually softened by the chamomile, not overpowering it. A truly well-balanced concoction that still satisfied my craving for something serious. John also believes that, like with any menu, there should be something for everyone which means featuring a variety of spirits, flavor profiles and methods. So, no, despite its proximity to the mall, the drink menu isn’t vodka intensive. The only vodka cocktail on the menu is the Century City Mule with citrus-infused vodka. In fact, whiskey is the spirit of choice for Craft clientele. So happy to have “discovered” my new favorite watering hole, and near a mall no less. A great way to cool one’s heels after a holiday shopping spree or, even better, sober up with some drunken shopping. This particular tasting may have been hosted but honestly I can’t wait to return on my own.